February 29, 1940 Robert Sengstacke Abbott, lawyer and newspaper publisher, died. Abbott was born November 24, 1870 in Frederica, St. Simons Island, Georgia. From 1892 to 1896, Abbott studied the printing trade at Hampton Institute. In 1898, he earned his law degree from Kent College of Law. However, due to racial prejudice, he was unable to practice despite attempts to establish law offices in Gary, Indiana, Topeka, Kansas, and Chicago, Illinois. In 1905, Abbott founded the Chicago Defender. The slogan of the newspaper was “American race prejudice must be destroyed.” The paper encouraged African Americans to migrate north for a better life and to fight for an even better lifestyle once they got there. 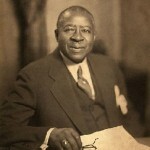 By the early 1920s, the Defender had a circulation of more than 200,000 and was known as “America’s Black newspaper.” It also made Abbott one of the first self-made African American millionaires. In 1929, Abbott co-founded the Bud Billiken Parade and Picnic in Chicago, Illinois, the second largest parade in the US designed to focus on Chicago youth. His biography, “The Lonely Warrior: The Life and Times of Robert S. Abbott,” was published in 1955. His home, the Robert S. Abbott House, was designated a National Historic Landmark in 1976.